In the past several years, minimally invasive surgery (MIS) has become increasingly popular with veterinarians and their clients. As the human-animal bond continues to grow, dog and cat owners are increasingly aware of and concerned about pain resulting from surgical procedures for their pets. Clients also associate their own medical experiences with those of their pets and frequently ask for less invasive, less painful procedures. MIS procedures provide both diagnostic and therapeutic value, allowing veterinarians to make challenging diagnoses and carry out therapeutic procedures at the same time. As in humans, veterinary MIS is surgery performed through multiple small incisions instead of one large incision. The benefit to your pet is less pain and a faster recovery. MIS falls into the categories of arthroscopy, laparoscopy and thoracoscopy. The location of the condition being addressed indicates the procedure involved. Arthroscopy is MIS of the joints. 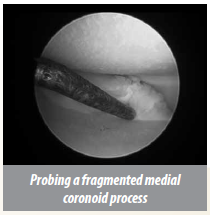 Arthroscopy has become the technique of choice for diagnosing a wide variety of joint disorders that might otherwise be difficult or impossible to diagnose. It is the main approach used in humans for joint surgery as well. 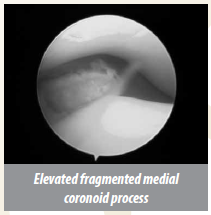 Arthroscopy is particularly useful for evaluating and treating diseases of the shoulder and elbow joints. Nonarthroscopic procedures used in these joints are much more invasive, often requiring cutting of bone, tendon or muscle to access the joints. With arthroscopy, joints can not only be more effectively evaluated, but can also be accessed with less patient discomfort and shorter recovery periods. 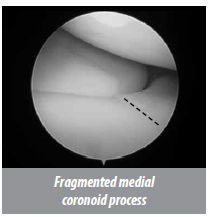 When is Arthroscopy Considered as an Option? Laparoscopy is MIS of the abdominal cavity. Multiple small incisions are made in various positions in the abdomen depending on the procedure being performed. Small cameras and instruments are placed into the incision ports and are used to visualize and treat the abdominal organs. As in arthroscopy, laparoscopy is utilized by MedVet as both a diagnostic tool and a treatment. When is Laparoscopy Considered as an Option? One of the most common applications for laparoscopic surgery is prophylactic gastropexy, to prevent gastric dilatation and volvulus (GDV). This life-threatening disease occurs when the stomach flips and twists in the abdomen and distends with air. This problem is most common in large breed, deep-chested dogs. Emergency surgery is performed to de-rotate the stomach and suture it to the abdominal wall (gastropexy), preventing it from flipping again. In dogs with this problem, this is a life saving surgical procedure. Prophylactic gastropexy ensures the problem will not occur. The procedure presents minimal discomfort to your pet. Ovariectomy is becoming an increasingly popular MIS option, replacing traditional “spay” procedures. The procedure is quick and results in less pain and discomfort to your pet than does the traditional invasive procedure. Biopsy of the liver and other abdominal organs are other common indications for laparoscopy. Thoracosopy is minimally invasive surgery of the thoracic cavity (chest). This can be very advantageous in the diagnosis and treatment of diseases with greatly reduced pain, discomfort and recovery time. Similar to laparoscopy, small incisions are made into the thorax and are used as ports for cameras and instruments for visualization, diagnosis and treatment. When is Thoracoscopy Considered as an Option? The most common indications for thoracoscopy are for the diagnosis and treatment of pericardial diseases and tumors. Pericardial effusion (fluid in the membrane around the heart) results in compression of the heart and eventual heart failure. This is commonly caused by tumors of the heart and by pericardial effusion with no known cause. Removal of the pericardium has been the classic treatment of this disease; but with thoracosopy we are able to make a small window in the pericardium to allow the fluid to escape and decompress the heart with less discomfort to your pet, rather than cutting the sternum to access the heart. Other applications for thoracoscopy are the diagnosis of various cancerous diseases of the thorax including lung tumors, mesothelioma, thymoma and ectopic thyroid tumors. In some cases, these tumors can also be treated with thoracoscopy. No. Your pet must be evaluated before surgery. This entails MedVet taking a complete medical history, physical examination, and detailed discussion of the recommended procedure. Preoperative bloodwork may also be performed depending on your dog’s age and health. How Long Will My Pet Be Hospitalized After Surgery? Patients generally go home the day following surgery. What is the Aftercare like Following Surgery? Aftercare for your pet is dependent on the procedure performed, but in general consists of between two and four weeks of activity restriction. This means leash-based activities only, with no running, jumping, playing or stair climbing. When your pet is not supervised, he/she should be confined to a cage, crate or small room. Detailed instructions will be discussed with you at the time of your pet’s discharge from MedVet. Do I have to Bring My Dog Back to MedVet for a Check up? Yes, routine follow up exams are advised so that we can be sure recovery is progressing along as expected. MedVet’s Surgery Department is uniquely qualified to perform all of these advanced procedures. Our specialists have received focused training in minimally invasive techniques and have performed hundreds of these procedures with successful results. All procedures include the administration of anesthesia by the most highly trained technical staff who are under the supervision of a board certified veterinary anesthesiologist using the best monitoring equipment to ensure your pet’s optimal safety and comfortable recovery.